Day two of our Vancouver Island adventure found us getting up a 5:00 am to see if we could capture a nice sunrise picture. The sky turned out to be overcast and the wind calm. We saw a sign for Grice Bay and decided to investigate. 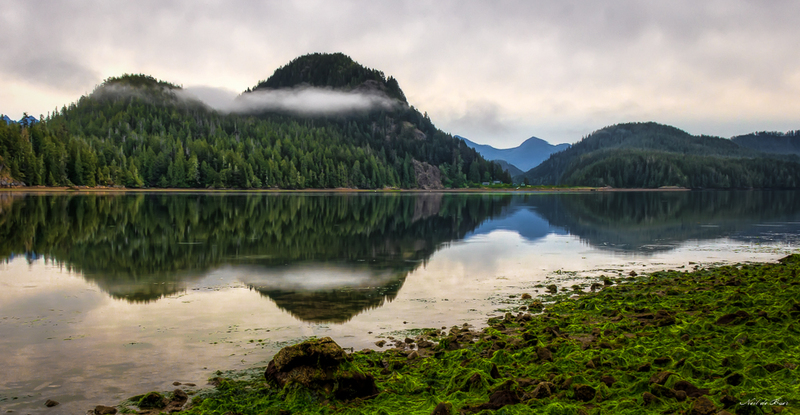 Our curiosity was rewarded with a mirror smooth bay at low tide with some mist on the mountain. Even though the sun rise was hidden the morning light was a delight! I took quite a few shots here and will share more over the coming days. This entry was posted on May 28, 2014 by Village Photography. It was filed under Uncategorized and was tagged with art, Grice Bay, Landscape, morning light, mountians, nature, photography, Tofino, Vancouver Island. Thank you. That is exactly how it felt! Reminds me of Prince George. Grice is one of my favourites haunts! The real beauty is at the far end but can only be reached by boat & high tide of course. We would loved to explore more but we only had a week on the island and tried to squeeze in as much as we could. If we ever come out that way again I will be in touch to learn about where find the real beauty in a already beautiful place!